A financial power of attorney is typically used when someone can no longer handle his or her financial affairs. For example, if someone experiences dementia, his or her agent would be able to use that person’s bank accounts and pay his or her bills with a power of attorney in place. Otherwise, the person’s family would have to petition a court to appoint a guardian to perform routine transactions. A power of attorney can also be useful to keep your financial matters running if you suffer an injury that requires a hospital stay, or you want to go on vacation for an extended period. Typically, affairs you can authorize an agent to manage include depositing checks, selling and buying real estate and other property, retirement plans, and taxes, among other matters. Ohio law recently changed to help prevent financial abuse of elders. 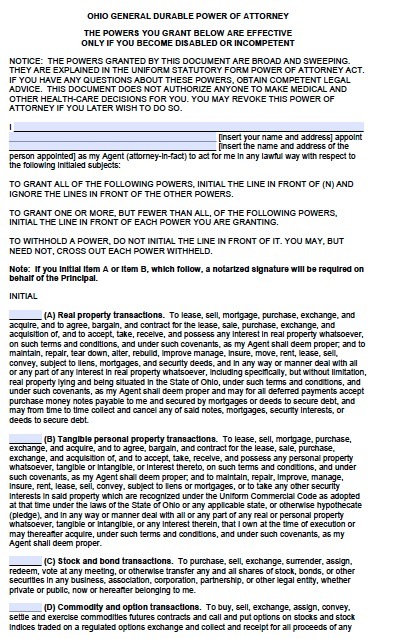 The state now requires power of attorney forms to indicate what agents may not do and what agent’s duties are. The agent’s duties include the duty to act in good faith, not to do anything beyond the authority the document grants, and to indicate your identity as an agent in writing whenever you act for the principal.